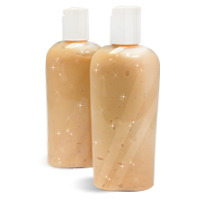 Learn how to make a shimmery lotion with this lotion making project. The white shimmer of this lotion and marshmallow scent fits well with winter and light fluffy snow. 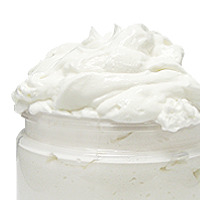 Create this fluffy lotion from scratch with butters/oils, water, and emulsifiers. 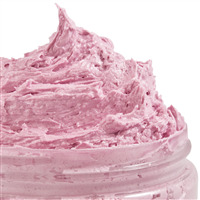 In this lotion making project we use Shea butter, coconut oil, and safflower oil as our butters/oils, and stearic acid and emulsifying wax as our emulsifiers. Once blended together and thickened we incorporate our additives. 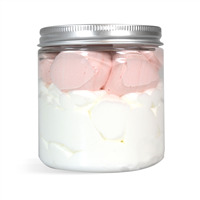 Marshmallow Fragrance Oil gives it a sweet smell while white mica adds the shimmer. The lotion is finished by packaging in eight-ounce clear bottles and closed with a saddle pump top. COMMENTS: This was my first time making lotion and it was so easy! Love the marshmallow fragrance, I did add a little more than it called for. COMMENTS: I followed the directions, yet I seemed to have something still crunchy in tot. 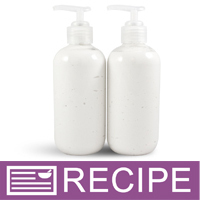 "Shimmery Marshmallow Fluff Lotion Making Kit"
COMMENTS: This lotion kit couldn't have been easier to make! The texture of the lotion is very fluffy and emollient . The lotion is silky and does not leave a greasy feel. I cannot even Begin to describe how delicious this sent is! COMMENTS: I originally purchased this lotion from a friend and was hooked. I recently asked her how to make it and she referred me to you! This was my first adventure into making lotion. I managed to get through it ok, but sure wished you had a tutorial video for the project. I watched several other lotion tutorials and that helped a bit. Of course, I had a funny mishap with the lotion going all over the counter when I tried to fill the bottles. No worries, my house smells marshmallowy delicious! One thing I would request to add to the kit is an eyedropper to measure out the fragrance oil. Other than that, I will definitely order again soon! Thanks! "Can't get enough of this!" COMMENTS: My customers rave about this-I have ladies having me ship out of state, and my girls won't leave it alone. One customer said it is like gold in her house and no one is allowed near it! Because it has been out of stock so long, I have had to go with the ingredients listed because my customers want it that badly. The shimmer is perfect as well. • Scent lasts all day. • Kit price is a deal. • Very light shimmer is beautiful. "Easy to use and informative kit!" COMMENTS: We are lotion newbies and this was our first attempt at making lotion. This kit, of course, came with everything we needed, but more importantly the instructions took us step-by-step through the process in an orderly fashion. And this marshmallow fragrance oil is absolutely lovely! It made us all hungry and lasts for hours on our skin. We've enjoyed testing the lotion on ourselves before giving it away to friends. It is definitely moisturizing, not too oily, and the little shimmery mica powder is a fantastic eye-catching bonus. We will definitely be venturing into another lotion project soon! "Can I use avocado oil instead of safflower oil and would it be at the same amount, or would there be a variation?" Staff Answer Yes, you can substitute the Avocado Oil for the Safflower oil in this recipe. You would substitute in equal amounts. Please be aware that you alone are responsible for product and recipe testing to ensure compatibility and safety.